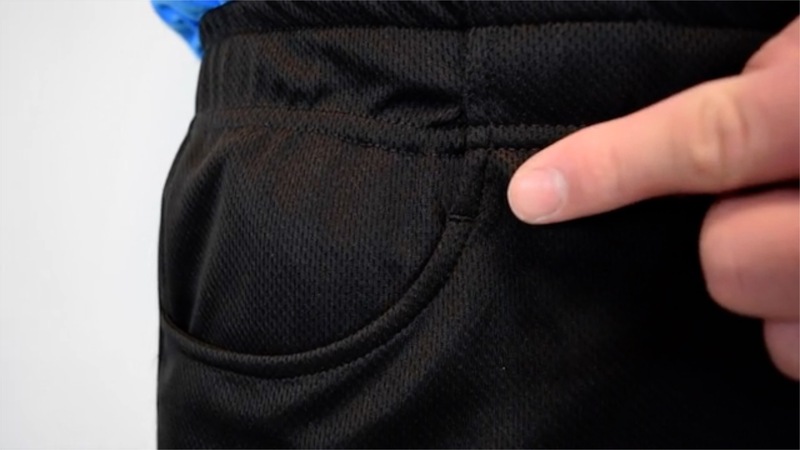 Athletic shorts currently on the market do a miserable job of keeping your stuff securely in your pockets. The reason for this is actually quite simple, the vertically cut pockets open in the exact spot your stuff naturally sits. After identifying the root of the problem, we knew the first step was simple, eliminate the vertical opening from the pocket. We then began experimenting with different styles of pockets that opened horizontally. We eventually ended with a horizontal pocket that sits just under your hip, has a curved design and features an industry leading depth of 11 inches. Vertically cut pockets open in the exact spot your stuff naturally sits, allowing your stuff a path to the floor. Horizontally cut pockets angle away from where your stuff naturally sits, keeping it nice and secure. WHY DON'T KEAPS USE ZIPPERS? We started experimenting with zippers early on when designing our shorts, but it was too annoying to constantly zip and unzip when pulling out our phone 1000x times per day. We noticed that people tend to open their pocket and not re-zip them closed which caused them to still experience the problem. WHY ARE THE POCKETS EXACTLY 11 INCHES DEEP? We wanted to make sure that your stuff was always accessible to you whenever you needed. So we measured the length of peoples arms down the side of their waist and found that the average persons arms lie 11 inches below their waist. WHY DON'T KEAPS USE VELCRO? We tried velcro after using zippers, but it was too rough to touch and people couldn't stand the noise it made every time they opened their pocket. To make matters worse.. velcro often would close the pocket when people wouldn't want it closed and would require two hands to get their stuff. WHY DON'T KEAPS HAVE POCKETS THAT OPEN ON THE SIDE? The reason stuff doesn't stay in most athletic short pockets is actually quite simple, the vertically cut (or side) pockets open in the exact spot your stuff naturally sits giving it a path to the floor. Horizontally cut pockets angle away from where your stuff naturally sits, keeping it nice and secure when you sit down.